Our two youngest members Joe Varallo and Wesley Davies will remember this year’s Arts Festival concert as the first concert when they appeared together. Joe is the son of Paul Varallo the choir’s principal soloist and Wesley the grandson of baritone and occasional soloist Duncan Hilling. 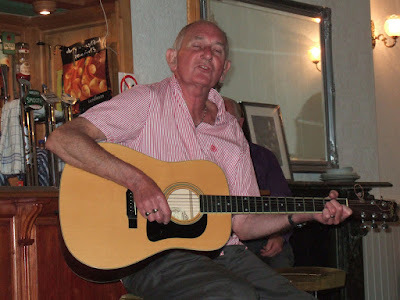 Duncan did in fact perform a solo spot on the night as part of the lovely song The Fields of Athenry. Following a Bruce Forsyth theme it is something of a “Brucie bonus” for the choir this week to have these two new members lowering the average age of the choir. He also used to say "You get nothing for a pair, not in this game" but we are hoping we’ll get a lot from this pair. These days Male Voice choirs, like so many other organisations, face an ageing issue with their main membership growing older and not attracting new and younger members. So it is good to see the new “boys” on stage after months of rehearsal. We would welcome many more. However when they found themselves having to move a heavy piano they might have wondered why we really want younger members. Paul Varallo’s songs in his solo spot were the Welsh lullaby Suo Gan, the Welsh song Y Darlun or “The Picture” based on a drawing of praying hands by Albrecht Durer, the Neapolitan song Return to Sorrento and a Victorian ballad called The Holy City behind which lies a tale. It is said that it was once sung by an opera singer awaiting trial for fraud in his cell while a group of men arrested for drunk and disorderly conduct were before the judge. The men were said to have dropped to their knees as the song began 'Last night I lay a-sleeping, There came a dream so fair. ', the lyrics contrasting with their previous night's drunkenness. The song's conclusion resulted in the judge dismissing the men without punishment, each having learned a lesson from the song. Another potential benefit from singing upon which we hope none of the choir members needs to rely during our coming tour of Malta. On the following Saturday the choir were commissioned to sing at the wedding of Ben Leslie and Kelly Jones so Manorbier Castle became Ben and Kelly’s little kingdom for the day. In beautiful autumn sunshine the choir sang on the central lawn as guests assembled and then inside the castle, sang the lovely song “She” from Notting Hill as the bride was escorted to the ceremony room by her stepfather Terry Morris. We enjoyed the day and we are grateful for the kind comments received and which are now on the choir’s website guest book. As the voices of a not wholly Welsh choir reverberated off the walls of a Norman Castle thoughts also turned to an imminent battle later that day in an English fortress some 200 miles away. As a long and demanding concert season in our anniversary year draws to a close, it was time for the choir members to let their hair down. Although this may not involve a large quantity of hair for some members they can still let down what there is in good style. Last Saturday was the actual anniversary of our inception that being 19th September, 1975. So those who could attend came along to a very sumptuous buffet and to a slice of birthday cake. What a lovely birthday cake it was too. 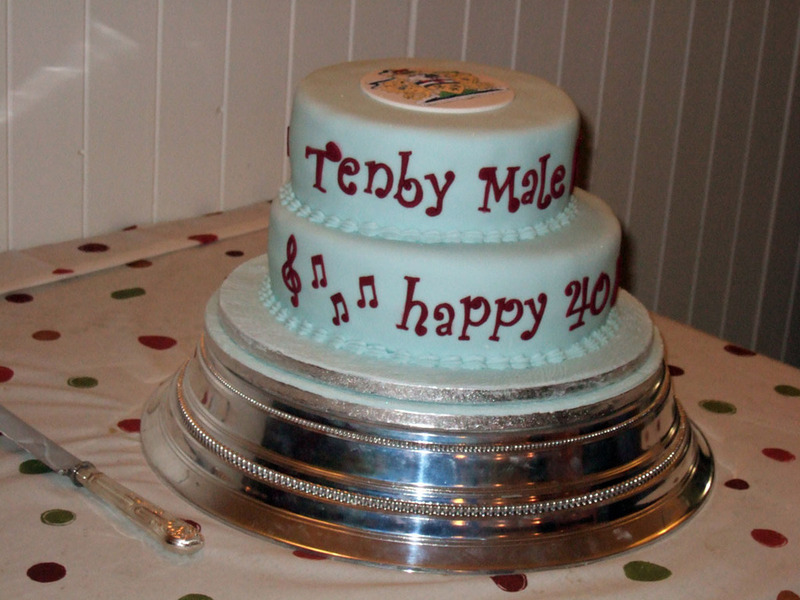 It was made by Gill the wife of choir founder member Tom Pearce. Gill teaches Cake Decorating and Sugarcraft at Pembrokeshire College and as the photo shows, husband Tom regularly advises by tasting much of the produce. Entertainment was provided by John Butland with a repertoire of well known hit songs from the past, those days when pop music really was music. Top of his bill was generally agreed to be Handbags and Gladrags. Our younger members may recognise this as a Stereophonics hit whilst my personal favourite amongst the other people who sang it was Rod Stewart who recorded it in 1969 with Mike D’Abo (Manfred Mann) who originally wrote it, arranging it and accompanying Rod Stewart on piano. 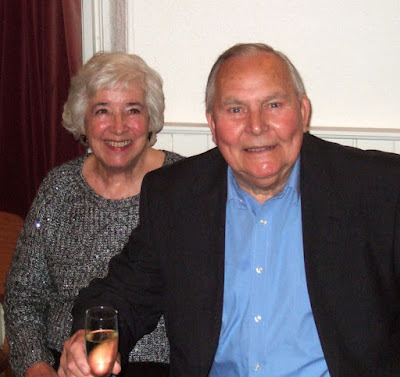 Also shown are choir top tenor Eddie Stapleton and wife Barbara. 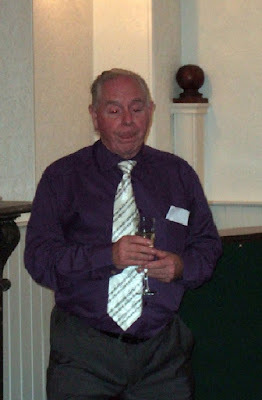 Against odds of 365-1 by coincidence Eddie’s birthday falls on the same date as the choir’s birthday but he’s been going twice and long as the choir as he was celebrating his 82nd birthday on that evening. I hope that isn’t water in his glass. Next week we have a concert in aid of the charity fund for the Lions Clubs International. “The Lions” donate to their local communities and also to major national and international charities and appeals. The concert will be at St. Mary’s church on Thursday 1st October at 8pm. Tickets available on the door. It’s always an enjoyable evening when we sing at a concert but it does make it extra special when we get good audience reaction and we are fortunate to have had many standing ovations and demands for an encore this year. Following the concert we also often have people come up to us and say how much they have enjoyed themselves, which is a very personal compliment. We also often get lovely and kind letters of appreciation which are read out at rehearsals but sadly they are read out and filed. So I am pleased to be able to announce that the choir website now has a new feature, a guest book, where you can record your comments for posterity. To access this just go to the choir website atwww.tenbymalechoir.org and click on the guestbook icon on the right hand side. There are a number of entries there already in just the first week. 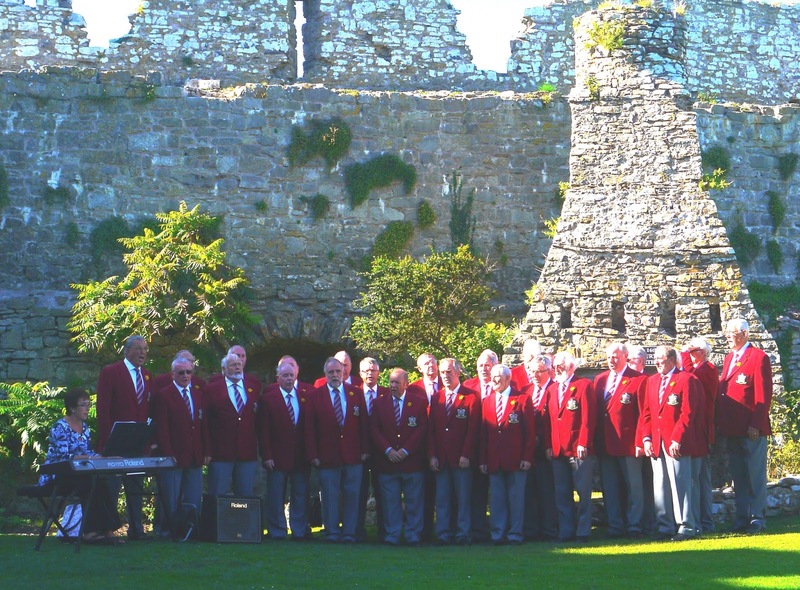 Tenby Male Choir – Will you be able to say “I was there”? There’s going to be a spectacular end to this week for the choir as tomorrow (Saturday 5th) will be the night of the grand Gala Concert celebrating our 40 years as a choir. I know from the post-concert comments we get that people are often mesmerised by the traditional finale to our concerts. This is the wonderful American trilogy which was made famous, of course, by Elvis Presley. They feel that way because it is a pretty spectacular combination of a large male voice choir singing at the top of their voices and complemented by the nerve tingling piano accompaniment of our splendid accompanist Jill Williams. These two alone would be impressive but at St. Mary’s church we are also joined by the massive church organ played by resident church organist Dr. John Harrison BEM. All of this is harnessed by our esoteric MD Ian Williams (no relation). So if that is enjoyable then the thought of three major male voice choirs, a brass band, the piano and the church organ is surely going to be a unique sound for those present to hear. If you have a ticket already you can look forward to being part of this by listening or even joining in. If, however, you are one of the unlucky people who don’t have a ticket then you may still have a few hours left to book one online (see below) or by phone from our MC and Treasurer Dave Blackmore on 01834 813061. Tickets can also be bought at The Card Shop near Barclays Bank in Tenby. If you would like to be emailed a copy of the full programme for this concert, contact our secretary David Stewart-Walvin on 01834 844926. Tickets for this major event cost £10. If you are really risk-oriented you could even try to pay on the door but may either be disappointed or find yourself with standing room only. Doors open at 6:45pm for a 7:30pm start to the concert. 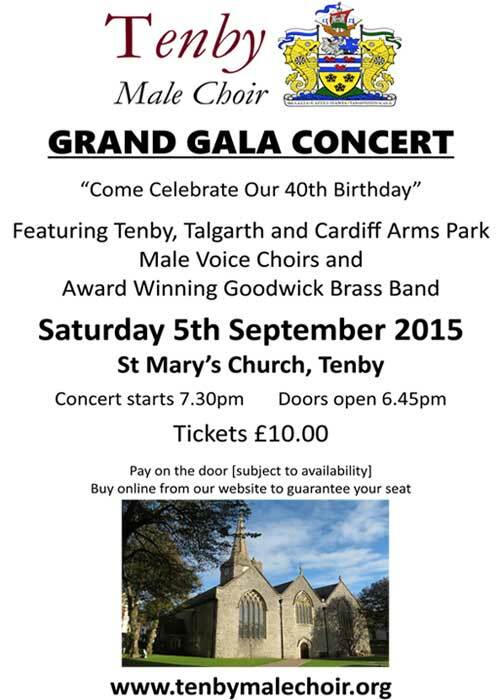 Only if you do get a ticket will you be able to say in future years “I was there for the Tenby Male Choir Gala Concert in 2015”. We have also recorded a CD for our anniversary year and CDs will be on sale at the concert. Sometimes a queue forms when people are buying them after a concert and so you are advised to ask for one on the way in to avoid being held up after the concert. They can also be purchased on line via the website. Last week’s concert was held in support of the RNLI and we once again sang to a large audience. They were not just supporting the choir but I am sure supporting a cause that many hold dear to their hearts. In a seaside town we benefit from the beauty of the sea but we are also exposed to its dangers. We all therefore feel reassured by the presence of our own lifeboat station knowing that it is there in times of need. Although we see the RNLI as being there in emergency we should also recognise that they also do a significant preventative job in educating children via schools and other children’s groups about the dangers of the sea and how to avoid them. We are proud to have raised over £25,000 for the RNLI over the years and pleased to make this further contribution to fund their role in emergencies and ongoing prevention. Our soloist on the night was the daughter of the lifeboat’s chief mechanic Stephen Lowe. Local violinist Hannah Lowe was accompanied by the lovely piano playing of her mother Sian. They played the fast and furious Hungarian Dance by Nolck, then by contrast the much slower Vocalise by Rachmaninoff, the melodious Lovers’ Waltz by Jay Ungar and finally the cheery, foot-tapping Intrada by Scottish composer Alfred Moffat. Our next concert after the Grand Gala concert will be at St. John’s church on 10th September starting at 7:30pm. 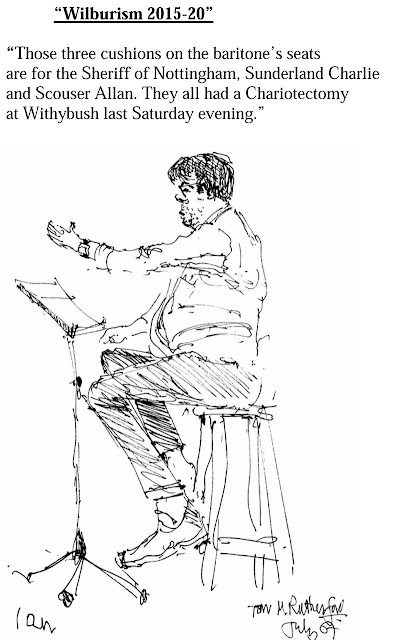 We offer a warm welcome to anyone at our rehearsals on Tuesday or Thursday evenings at the County Club. Feel free to come along at 8pm to see how we go about learning our songs and music. It’s also a great way to test the water if you have ever thought about joining a male voice choir. Experience and age don't matter. The choir website is www.tenbymalechoir.org and on the website you will find links to our Facebook page, the choir blog, some video recordings of the choir and of course information about concerts and our programme of events.